American Farmland Trust and the nationwide food guide, Real Time Farms, have joined forces for this year’s Dine Out for Farms™ . From October 16th-22nd participating restaurants nationwide will educate diners and raise money to conserve precious farm and ranch land. Similar to the America’s Favorite Farmers Markets™ contest, the idea for Dine Out for Farms™ came from talking with chefs eager to spread the No Farms, No Food® message. With increasing demand from diners for fresh, local ingredients from local farms, chefs were eager to support the conservation of their local farm and ranch land. They want to see their farm sources stay in business. In the event’s 2010 inaugural year, 40 restaurants participated, and this year, they aim to double that number. It was a natural fit for Real Time Farms to partner with American Farmland Trust on this mission. American Farmland Trust aims to conserve farm and ranch land, thereby conserving local farms and local food. Real Time Farms helps consumers, whether eating in or dining out, trace their food back to the farm it came from enabling them to make educated decisions about the food they eat. Consumers learn all about the farms that form the backbone of our food system, thereby highlighting the necessity of farm and ranch land conservation. Show your support for your local farms and educate your diners! Become a participating restaurant! 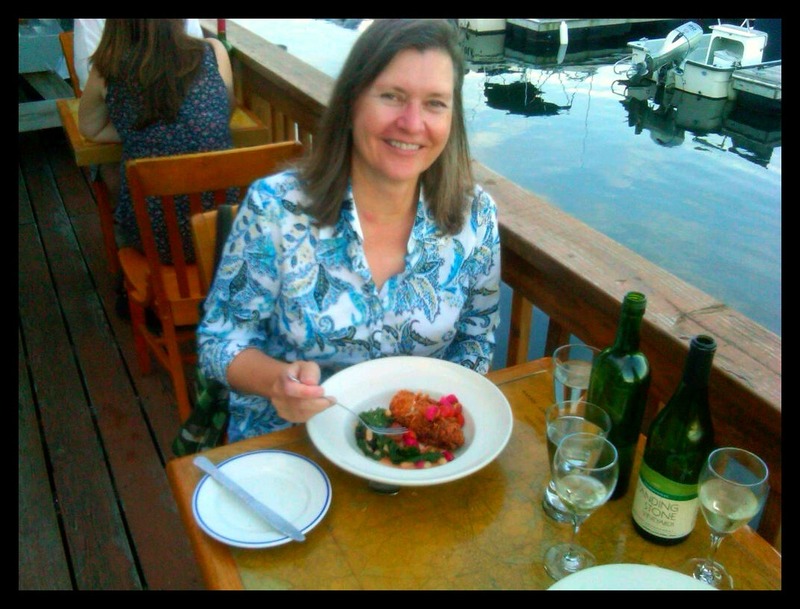 Jane Kirchner, Senior Director of Marketing and Communications, American Farmland Trust at one of last year’s participating restaurants , The Market Restaurant on Lobster Cove, in Gloucester MA. As a participating restaurant, you will receive a host of online and offline promotional tools, as well as the benefit of American Farmland Trust’s and Real Time Farms’ combined press and outreach efforts. A complimentary 3-month subscription to Real Time Farms (a $120 value). Participate in this year’s Dine Out for Farms™ and you get the chance to show your support in October, as well as the chance to try out Real Time Farms’ set of tools – which allow you to tell the story of your purveyors and educate consumers year round. Real Time Farms recently launched a set of tools designed specifically for restaurants to use to easily tell the story of every ingredient. Whether visiting Real Time Farms or the restaurant’s own website, diners can browse a menu, click on an ingredient (e.g “tomato”), see pictures of the tomato in the field, learn how it was grown and who grew it. Food transparency made simple. In the 15 weeks since these tools have been available for self sign-up nationwide over 45 restaurants (including nationally acclaimed Zingerman’s Roadhouse, FIG Restaurant, Northern Spy Food Co., Equinox, Bourbon House, Melisse, and even The White House) have begun using these tools to tell the story of their ingredients on Real Time Farms and often on their own websites (e.g. Northern Spy Food Co.). Good for people. Good for you. Good for farms. What could be better? ENROLL NOW! This entry was posted in Messages From the Founders and tagged American Farmland Trust, dine out for farms, farm conservation, Real Time Farms, restaurants, the white house, zingerman's. Bookmark the permalink.